If you're interested in Mystery Shopping Jobs, it's important to learn How to Mystery Shop first. There are some top secret tips to make the most amount of money possible, and not get caught in a scam. 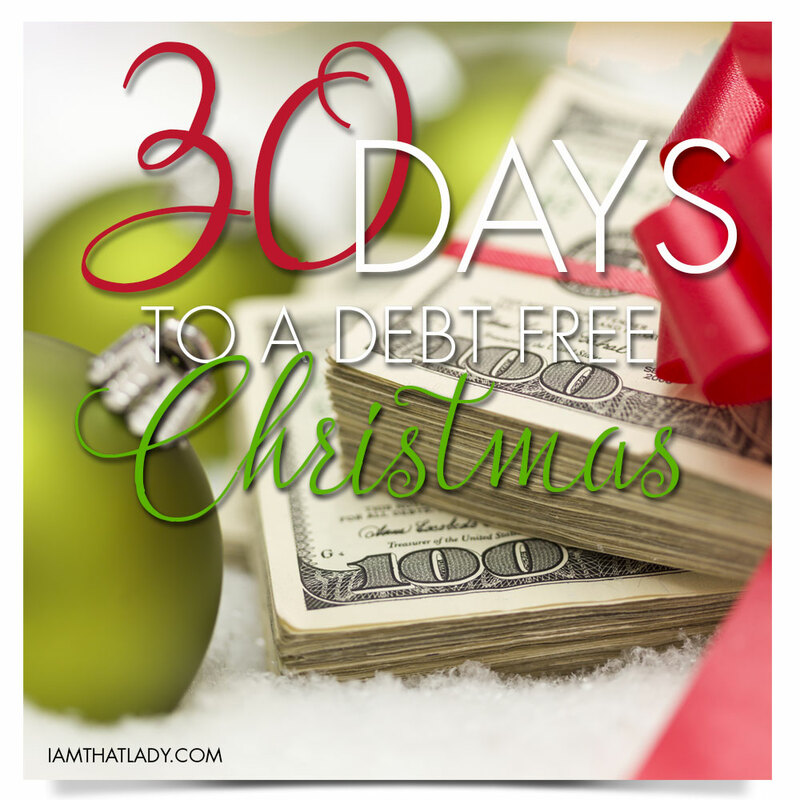 This is Day 5 of the 30 Days to a Debt Free Christmas Challenge! Remember to join our Facebook Group to get today's challenge. Back in my “cash-based broke college student days,” I stumbled on mystery shopping as a way to make a little extra income and get free fast food at the same time. After college, life got hectic and I stopped my mystery shopping jobs. But I always suggested it to busy friends who were looking for some additional income that wasn’t time-consuming. After a few years of that, I came across a podcast that reminded me that I should incorporate mystery shopping back into my busy life as a way to avoid taking on holiday season debt. Since I’m in the middle of my debt-free journey, I believe in giving every dollar a job. So I designated the mystery shopping income I earned as Christmas gift money. As part of a structured cash flow plan, mystery shopping is a simple and flexible way to help you avoid the credit card charging ritual that happens when gift-giving season takes us by surprise once again. Corporate clients of mystery shopping companies range from clothing stores and car dealerships to dining and retail establishments. I’ve even come across a company that provides mystery shoppers for churches! These corporations use mystery shopping as a way to measure how well their existing processes work and how great (or not-so-great) their employees’ customer service is. Mystery shoppers actually help corporations improve in these areas by the feedback they give. 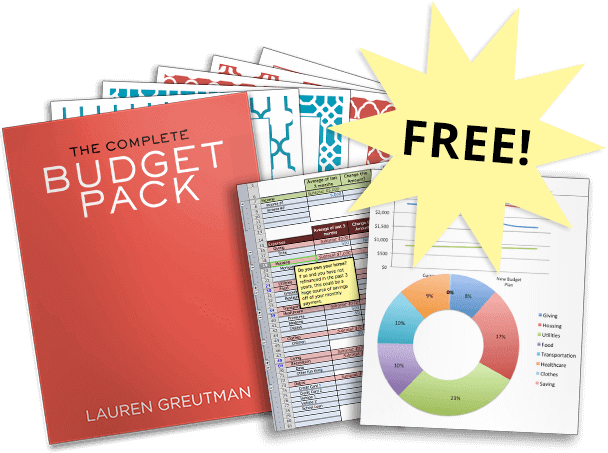 Step 1: Establish a holiday budget and plan your workload for the year. Everyone’s budget is different and this will affect the types and number of shops you choose to accept throughout the year. I like to set a goal of $100 per month (not including reimbursements for expenses). Around the holiday season, I shop less because I take a small break to prepare for the upcoming tax season and visit with family. So I may perform shops totaling $100/month for a minimum of ten months out of the year. This gives me about a $1,000-holiday budget to shop for the many kids in my family. If your budget is higher, you may want to focus your attention on the high-value shops (those paying $20 or more). Step 2: Set up a separate bank account just for gift-giving and the holiday season. Establish a checking account with a debit card so that any expenses can come from that account and not affect your regular money. All checks and Paypal payments can be rolled over into this account and all expenses incurred should come from this account before reimbursement. Just make sure to designate this account as your MYSTERY SHOPPING BUSINESS account. Step 3: Find Mystery Shopping Jobs near you & sign up with mystery shopping companies. To make sure you don’t get involved in any scam situations, sign up with the collective organization of reputable mystery shopping companies. 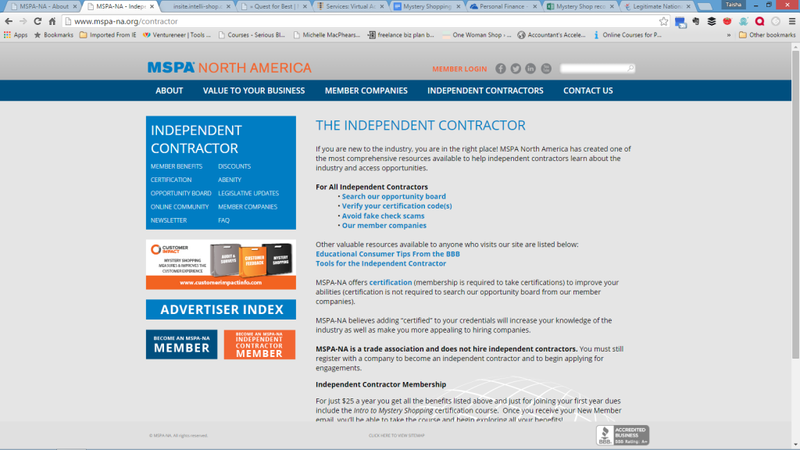 I recommend the Mystery Shopping Providers Association. Visit their website and click “Search our opportunity board.” Search by your zip code and you will get a pretty good idea of the assortment of shopping opportunities available in your area. Going through this site ensures you will be able to start connecting with legit companies, not scam artists (never EVER pay anyone to receive shop opportunities, by the way). Never pay to RECEIVE mystery shops, and if an organization says that they charge to receive shops, it's a scam. All of the companies that are listed on the MSPA don't charge for you to obtain shops. The MSPA itself has a membership and certification program, which takes your mystery shopping to a bit higher level, but it is not required to be successful. MSPA is more like an overseer in the mystery shopping industry. Your mystery shopping will be for those companies that are MSPA members, not the MSPA. To find the free shops – Visit their website and click “Search our opportunity board.” That is free and will let you connect to the companies themselves. There are so many good companies, and several that operate in their own particular niche (car dealerships, dining, clothing stores, phone audits, etc) so you will want to sign up with as many as possible to get a good variety of shops to choose from. Step 4: Determine how much time you have to spare. I set a goal to do no more than two shops in a week in order to make that extra $100 per month. If I come across a high-value shop (for example, a bank shop that was $20 or an electronics store shop that was $30), that’s fewer I need to do that month to reach my goal. The beauty of this income stream is its flexibility. Some shops are part of your everyday activities and for things you have to do anyway (just had a free oil change done early October!). If your schedule allows, you may even want to pick a day during the week to schedule shops near each other and fulfill them in a predetermined block of time (which is why you should sign up with as many companies as possible for more options). If you focus on performing the shops for things you would do anyway (car shopping, researching a new laptop or TV purchase, eating out), the extra time invested is simply for taking notes and answering the questionnaires. For example, some companies hire shoppers to evaluate diners at the airport. If you are usually early for your flight, why not schedule a dining mystery shop to do while you wait and score a free meal at the same time? 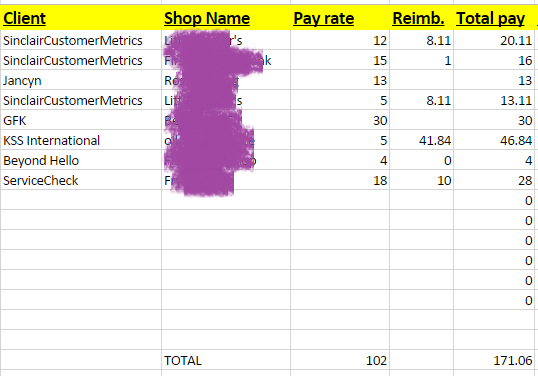 I usually do 6-7 shops a month and earn $80-$110 depending on the pay rate. That comes out to over $1,000 a year if done consistently, and that doesn’t even include the value of the free services I receive! Many shops ask that you don’t bring kids with you, but some ask that you do. It depends on the type of business it is. Keep this in mind when scheduling around your family activities. Keep in mind that every company doesn’t send your money the same way. Some of these companies can take up to 2 months to send a check in the mail, while others Paypal it within a few weeks. To keep the cash flowing, be consistent about doing shops every month. You shouldn’t be spending the money anyway until you need if for your holiday shopping. Finally, as a tax professional, I just can’t skip out on reminding you of the possible tax implications. As a mystery shopper, you are considered an independent contractor, NOT an employee. As an independent contractor, any company that pays you over $600 in revenue is required to issue a 1099-misc at year’s end for income reporting purposes. Be sure to include these forms, as well as any other income not reported by the agencies, on your income tax return. The income is subject to income tax and may be subject to self-employment tax. Seek the advice of your tax preparer for your individual concerns. Unless you are really earning some serious cash (in the thousands per year), your earnings shouldn’t have a significant impact on your tax bill. So as long as you are intentional about your time and the money that you need for the holiday season, you should be able to grab a free pizza for your kids, get your oil changed, shop for a new TV or take your significant other out for a nice meal and a movie at no cost to you and all while running the errands you would normally be running anyway. 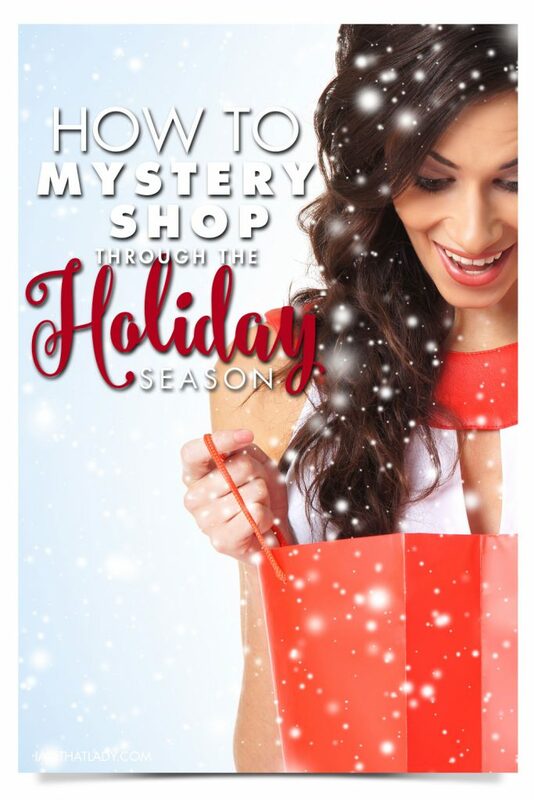 I would love to know how mystery shopping has funded your holiday season by this time next year. So start today! 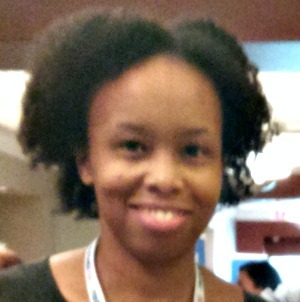 This is a guest post from Tai Stewart at Saidia Financial Solutions. Tai Stewart is the founder of Saidia Financial Solutions, a full-service accounting and tax firm that assists solopreneurs and small business owners by equipping them with the tools they need to win financially. We do this through customized tax strategies and business financial education. Great way to earn extra money. Everyone shops, so it wouldn’t be a strain on time. If you are organized with your outings, it would be very easy to incorporate being a mystery shopper.